“A falsehood which dies hard is the idea that stimulants of whatever kind actually give strength and are necessary for the maintenance of health and vigour. Such is not the case, and the well-worn comparison that they are the whip and spur and not the corn and grass is strictly accurate. Anything accomplished under the influence of stimulants is done at the expense of blood and tissue, and, if frequently repeated, at the expense of the constitution.”—The late Sir W. Broadbent, M.D., K.C.V.O., LL.D., etc. “Besides chloroform, alcohol may be mentioned as another drug which, while it renders the systolic output incomplete, increases the diastolic pressure and the dilatation of the heart.”—Leonard Hill. M.B., Text-Book of Physiology, edited by E. A. Schäfer, LL.D., F.R.S.. 1900. “It has been shown, as well by experiments on animals as by observation on man during life and after death, that alcohol weakens the heart, causes hypertrophy and dilatation and fatty degeneration of the muscular fibres, and that it thus increases the natural tendency to failure of the heart which is usual in old age. Alcohol, by augmenting this tendency, adds to the danger arising from acute diseases, such as influenza and pneumonia, since persons with weak hearts much more readily succumb to such diseases than persons with strong hearts.”— Sir Hermann Weber, M.D., F.R.C.P., Alcohol and Old Age, 1906. “Alcohol has a somewhat similar effect on the heart to that produced by the typhoid toxin.”—Sir Jas. Barr, M.D., etc. By the circulation we understand the driving of the fluid blood, round and round the body, through the blood-vessels, such driving being maintained by the pumping power of the heart, which is practically a hollow muscle. In consequence of this pumping power of the heart, the blood in the vessels is under considerable pressure, which is naturally increased if the blood-vessel be narrowed or con­ tracted, and diminished if the blood-vessel be expanded or dilated. When studying the action of alcohol on the circulation, we have therefore, first, to consider its effect upon the action of the heart, and, secondly, its effect upon the blood-vessels of the body. 202 ALCOHOL AND THE HUMAN BODY chap. This greatly debated question has been approached by investigators by different methods, and probably to this variation is due some of the opposition of results. Thus clear distinction must be drawn between the results observed to follow the action of alcohol on the heart when that organ is part of an intact animal, subject both to the nervous system and to the mechanical conditions produced by the varying states of the peripheral circulation, i.e. blood-vessels, and those following the administration of alcohol to the isolated living heart removed from the body and the influences of other structures. The most positive effects observed in support of the adjuvant action of alcohol are those recorded by Dixon3 upon the isolated heart, i.e. removed from the body and kept in activity by an artificial flow through its cavities of nutrient and oxygenated fluid to which alcohol in known quantity was added. Dixon found that the mammalian heart under those cir­ cumstances exhibited at first an increase of power which soon became followed by a diminution or depression. 1 Martin and Stevens, Studies from the Biological Laboratory of Johns Hopkins University, 1889. 2 Alcohol and the Cardio-Vascular System, by Dr. Munro, Physician to Glasgow Royal Infirmary and Professor of Medicine in St. Mungo’s College ; and Dr. J. W. Findlay, Assistant Physician to Glasgow Royal Infirmary. 3 Journal of Physiology, 1906, p. 346. 4 Skand. Archiv. fur Physiologic, 1906.
alcohol produces its well-known depressant action on the heart soon, and all workers are agreed that so soon as the small quantity of ·5 per cent of alcohol in the blood is reached a rapidly developed weakening of the heart’s action ensues. Martin found the same effect from ·25 per cent. Thus direct experiment upon the whole heart shows that alcohol has not the augmenting power formerly attributed to it, but that, on the contrary, it slowly depresses the action of the heart-muscle, and ultimately partly paralyses not the muscle only but also the delicate nerves which are present in the wall of the heart. This paralysis of the cardiac nerves largely accounts for the acute dilatation of the heart and the fatal failure of that organ, which often occur when people have drunk large doses of alcoholic liquids. An objection may be raised that alcohol is used with success in the restoration of those who have fainted ; and this matter may now be conveniently dealt with. It must be borne in mind, in the giving of all remedies by mouth, that the mere act of swallowing or sipping accelerates the action of the heart, causing it to beat more quickly. Whether it be water or alcohol or simply saliva is immaterial as regards the value of this act of swallowing, which reflexly tends to relieve the heart. Therefore our first effort with a fainting or exhausted person is to induce them to swallow or sip something—and if possible a liquid that is warm. 204 ALCOHOL AND THE HUMAN BODY chap. have stated above, the proofs of actual heart stimulation are wanting. These facts are in undoubted opposition to the almost invariable practice of giving alcohol, in the belief that it improves the tone of the heart and its circulation—but, as has just been shown, the ideas on which such use of alcohol is based have now been found to be incorrect. This notable development of clinical opinion is strikingly exemplified by the extraordinary reduction of the amount of alcohol given in hospitals, and by the successful issue of cases treated entirely without it. A glance at the chart on p. 5 will at once indicate the way in which medical treatment has completely altered in regard to the prescribing of alcohol. It is no longer given by physicians and surgeons as a routine and serviceable remedy required to help the heart and digestion, although some practitioners still permit a certain amount to be taken when patients state that they are dependent upon its habitual use. A most striking proof that alcohol is not only of no service in the restoration of the heart’s action, but that it is distinctly depressant, is exemplified by the treatment of cases of “shock.” Crile 1 has shown by direct experiment on the state known as “shock” that alcohol only aggravates the conditions resulting therefrom ; and wider experience has demonstrated that hypo­ dermic injections of strychnine and atropine, and the use of other substances,2 are far better calculated to bring the patient out of danger than the alcohol, so often given as a routine, while other far more valuable remedies are omitted. 1 Blood­ Pressure in Surgery, by George W. Crile, A.M., M.D. 2 Notably the subcutaneous injection of large amounts of water. of hypodermic injections, and their remarkably rapid and certain effect. In modern methods of treatment reliance is always placed upon the above-named drugs in cases of danger, few dreaming of depending on alcohol. Fig. 29.—Two drawings of muscle-fibres from the heart and magnified 375 diameters. The regularly striated muscle-fibres on the left hand are healthy. The fibres on the right have almost entirely lost their striation, and their substance is infiltrated with droplets of fat which have been stained black. Thus the fibres are in an active state of fatty degeneration. This diseased specimen is taken from a patient suffering from chronic alcoholism. under such circumstances being more that of a narcotic and sedative. Not a few persons, especially the aged, suffering from some chronic ailment, have been rendered bedridden, and have lost all disposition and ability to move about, as a result of this mistaken use of alcohol. 206 ALCOHOL AND THE HUMAN BODY chap. of fat in the fibre itself. Fig. 29 shows the difference between a normal fibre and that rendered flabby by containing deposits of fat. A heart thus weakened tends to dilate, and this common and serious condition we must now consider. which they need ; and as a result of this semi­starvation they naturally deteriorate. 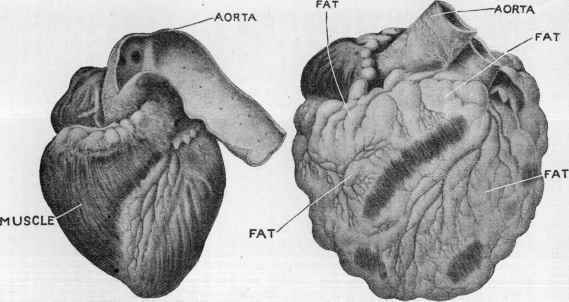 This partial starvation occurs also in the tissues of the heart itself, and is a most serious thing, considered in the light of the stupendous task which that organ has to perform throughout life, a task which it can only accomplish satis­ factorily as long as its blood supply is perfect and its muscles nourished. 2. Acute dilatation occurs not infrequently in those whose heart-muscle has been for years somewhat undermined by alcohol and other indulgences. A fatty and dilated heart requires but little stress (such, for instance, as a mild attack of illness or an attack of indigestion) to make it dilate suddenly and even fatally. One of the early indications that the foregoing changes may be occurring in a heart is a sense of fatigue and breathlessness on slight exertion, or a feeling of disinclination for normal effort. teacher or thinker—his powers of body and mind being at their best. Too often are these powers impaired, and the normal resistance to disease and death lessened, by what is often regarded as an ordinary dietetic use of alcohol. When the death of a man in the prime of life is announced, the first thought ought to be : “ Need he have died ? ” In the large majority of these cases, a little investigation will show that what should have been a normally resisting heart has been weakened by daily habits and social customs. On the other hand, it is happily an everyday experience to hear of a patient recovering from a severe illness mainly because of his temperate life. In other words, his organs, especially his heart, are in a healthy state, and thus are enabled to combat disease successfully. 1. Chronic Congestion.—When alcohol is swallowed it produces, as we have seen, a local effect on the blood-vessels of the stomach (p. 146), and almost simultaneously causes dilatation of the blood-vessels of the liver, which organ becomes turgid and swollen. The same condition obtains (as soon as alcohol reaches them) in the other organs of the body, their vessels becoming dilated—whether by local or reflex action is not determined, but probably by both agencies. Repeated doses of alcohol, of course, render this dilatation of vessels more and more permanent, and as the flow of blood through the widened channels is necessarily slower (especially in view of the impaired action of the heart), a condition of stagnation, or what is called chronic congestion, ensues. Fig. 30.—Two drawings of the human heart. The smaller one on the left (No. 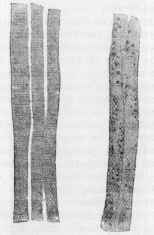 1) is a healthy specimen, the larger on the right (No. 2) is a fatty and dilated heart from a beer-drinker. These are taken from excellent coloured drawings by Dr. C. Henning from preparations by Professor Weichselbaum, and are reproduced by kind permission of the Austrian Anti-Alcohol Society. The muscular substance of the beer-drinker’s heart is not only itself fattily degenerated, but it is greatly overlaid and hampered by the overgrowth of fat which, as is well shown in the figure, is but a gross exaggeration of what exists to a moderate degree in health. Note that the ordinary muscle is hardly to be seen. 210 ALCOHOL AND THE HUMAN BODY chap. actual disease of the kidneys and other organs sets in, this chronic congestion leads (for example) to such a condition as albuminuria—that is to say, to the escape of the extremely important albuminous constituents of the blood into the water which passes away from the kidneys. Moreover, as soon as a state of chronic congestion is estab­ lished in any part, the delicate chemical changes between the blood and the tissues nourished by it are so seriously interfered with that the tissue begins to undergo the first stages of fatty degeneration. 2. Alteration in the Walls of the Blood-Vessels.—Dilata­ tion of vessels and consequent congestion is not the only alteration induced by alcohol in the thousands of blood-vessels which penetrate every part of the body. A most important change takes place in the actual walls of the blood-vessels, i.e. a degeneration of these walls which occurs as the direct result of the constant taking of alcohol. For many years it has been known that a thickening occurs in the walls of the blood-vessels of many persons. Microscopi­ cally this change is shown to be due to an increase of the normal fibrous tissue existing in this position, and in some cases there is found to be accompanying it a condition of fatty degeneration, and also even of calcification of the vessel-wall (pipe-stem vessels). This fibroid thickening leads to a lack of elasticity and contractility in the vessel-walls, and therefore to a delay in the blood-current, and to a stagnation or stasis of circulation. In consequence of this a much greater amount of work is thrown upon the heart, which therefore is obliged to use up its reserve power and energy. Interference with Nutrition.—It must be remembered that all the nutritive action of the blood depends on its power of filtering rapidly through the walls of the blood-vessels to the tissues,—and, conversely, its power of drawing off the waste products of the tissue depends on the facility and readiness with which such products can penetrate the walls of these vessels. 1 Professor Sims Woodhead, The Practioner, November 1902. As soon as degeneracy sets in the walls of all the vessels tend to become thickened, and the active transference of liquid through them being more or less prevented, the nutrition of the body is gravely hampered. This process of thickening in some people is very slow, in others it is rapid. As it advances, the vessels become not only less able to adjust themselves to the constant variation of the pressure of the blood within them, but finally unable to withstand that pressure. They therefore frequently rupture and produce hæmorrhages and apoplexies, which, when occurring in the brain, cause paralysis and mental decay. (2) The continuation of the habit in middle life. “Professor Baeumler further directs attention to the fact that persons consuming large quantities of beer mechanically overtax their blood-vessels by keeping them in a state of distension, which gradually leads to the disease of the small arteries and, later on also, of the heart, the work of which becomes additionally more and more increased by the morbid state of blood-vessels. My own experience amply corroborates Baeumler’s view.”—Sir Hermann Weber, M.D., On Means for the Prolongation of Life.